La Vie C’est Si Bon! Our Girl In The City Of Lights! Poppy Parker Arrives in Paris Today! Soon, she will see the sights and experience all of the joys that the City of Lights has to offer. World class shopping, modeling for a top designer at the Paris shows, and participating in an ad campaign… and that’s just for starters! Long awaited by collectors and fans alike, the Bonbon Collection is composed of scrumptious looks that brings variety and perhaps the most desirable dolls in the collection since its debut! Poppy Parker™ just came back from shooting the cover of her very own record! A little uncertain of her ability to sing in French at first, Poppy quickly discovered that she’s a natural and nothing is easier than singing “Je T’aime” in French when you have the best Jazz band in Paris setting the tone! Poppy is ready to release a hit record that will be remembered for generations to come and the best part? “Le tout Paris” cannot get enough of her adorable American accent! Poppy Parker™ is an 11.5-inch fully articulated fashion doll with hand-applied eyelashes and blond bombshell rooted hair! Poppy’s sweet and coquettish look is composed of a perfectly fitted, pale pink micro checkered dress with a white ruched chiffon detail at the bust. Poppy comes complete with black faux patent leather kitten heel shoes, a bracelet, earrings and her miniature vinyl record. The little flower is ready to steal the hearts of her new adoring fans! It’s Poppy’s first night in Paris and there is party in honor of the visiting American models. As a gift, each girl received a Paris original to wear to the event. 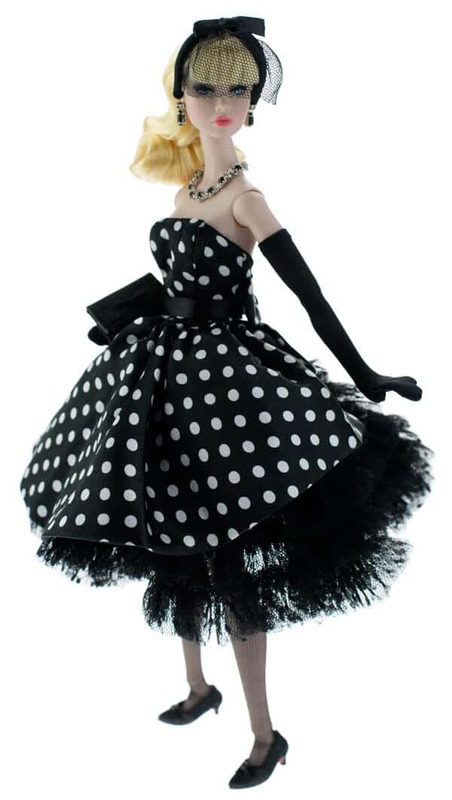 Poppy chose a black and white polka dotted cocktail dress with black gloves. She topped of the ensemble with a black tulle spectator headpiece that she brought from home. What could be more French than polka dots in Paris? Poppy Parker is a fully articulated 12.5-inch doll with fully rooted hair and hand applied eyelashes. For adult collectors ages 15 and up only. This doll cannot stand alone; a doll stand is included. Poppy spends one of her first days in Paris shopping at all of the boutiques on the Champs-Élysées with her model friends and chaperone. There is so much to see! Poppy decides to wear her smart yellow suit with black accent belt and top it off with a dramatic flocked hat, black gloves and faux pearl jewelry! A look that is perfect for spending a wonderful day shopping. Poppy Parker is a fully articulated 12.5-inch doll with fully rooted hair and hand applied eyelashes. For adult collectors ages 15 and up only. This doll cannot stand alone; a doll stand is included. As Poppy arrives at the airport in Paris, she is greeted by her French chaperone Mrs. Chatelain, who was provided by the Paris modeling agency. “Bonjour Mademoiselle!” are the first words Poppy hears and she is delighted to make her first acquaintance in France. 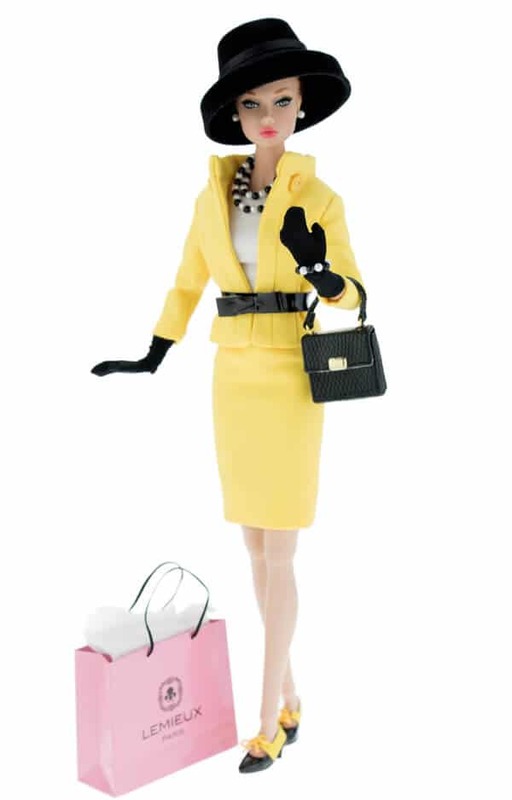 Poppy’s travel ensemble includes a lovely sea foam sheath dress and a black and white houndstooth coat with matching beret. A pair of assorted duo-toned kitten heels and a fully functional customized travel train case given to her by her grandmother finish off this lovely ensemble. Poppy Parker is a fully articulated 12.5-inch doll with fully rooted hair and hand applied eyelashes. For adult collectors ages 15 and up only. This doll cannot stand alone; a doll stand is included. Poppy Parker explores the City of Lights with glee, her ears filled with romantic songs! Composed of all of the elements for Poppy to easily go from day-to-night and back, the Ooh La La! gift set is designed to give Poppy Parker fans tons of redress possibilities by creating their own mix-and-match combos! This exquisite Poppy Parker doll also marks the debut of a brand new eye screening! 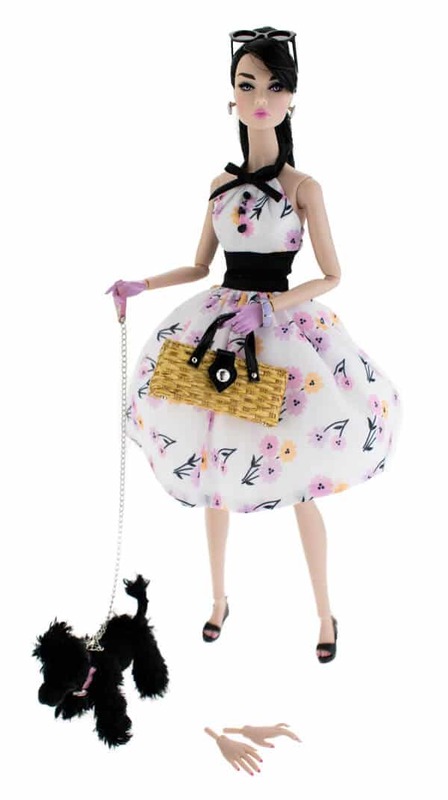 Poppy Parker is a 12-inch fully articulated vinyl fashion doll with a scrumptious fully rooted hairstyle and delicately hand-applied eyelashes! This absolutely fabulous gift set includes Poppy’s Parisian mix-and-match separates, colorful bracelets and silver hoop earrings, her delightfully printed tote, two pairs of interchangeable hands, a pair of authentic cork wedgies, bright red slingback shoes and a doll stand, all packaged in a gorgeous window box gift set! The modeling agency has invited all of the American models to the Palais Garnier for a night at the ballet. Poppy simply cannot decide what she should wear. She decides on a lovely turquoise brocade cocktail dress with a tulip skirt and coordinating jewelry. She throws on her faux fur wrap, grabs her matching clutch, tucks her tickets inside, and she is out the door. Poppy Parker is a fully articulated 12.5-inch doll with fully rooted hair and hand applied eyelashes. For adult collectors ages 15 and up only. This doll cannot stand alone; a doll stand is included. Jean Pierre Jourdan is the most popular couturier in Paris. Poppy has been selected to model his stunning creation in his latest fashion show. The strapless white brocade gown is contrasted with an obi style waistband and long dramatic train in lilac. 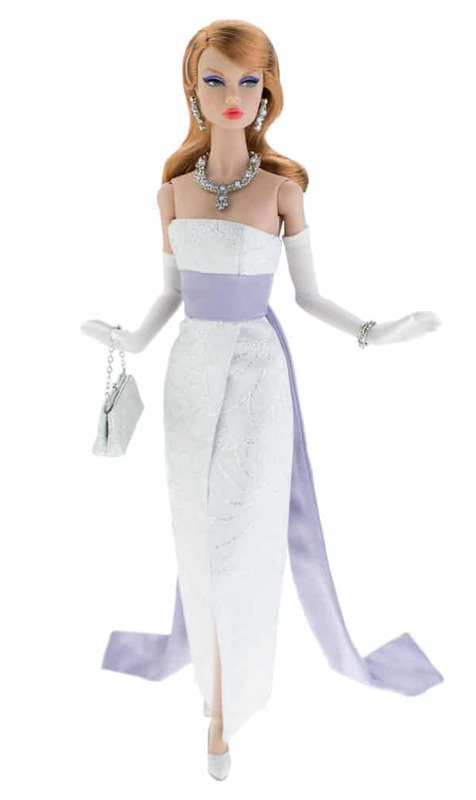 A matching clutch bag, shoes, and long white opera gloves complete this stunning couture ensemble that is truly Magnifique! Poppy Parker is a fully articulated 12.5-inch doll with fully rooted hair and hand applied eyelashes. For adult collectors ages 15 and up only. This doll cannot stand alone; a doll stand is included. The most exciting modeling experience Poppy has ever had is working for the fragrance company Amour. Poppy will be featured in their latest campaign. She will represent the face of the brand as “Miss Amour”. 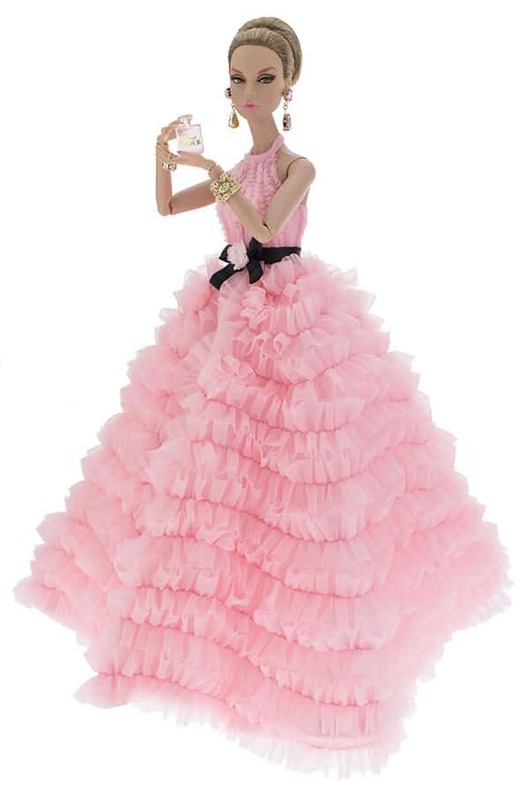 Poppy received another ensemble created by the talented Jean Pierre Jourdan to wear in the photo- a frothy ball gown of gathered pale pink tulle accented with a black belt and flower detail at the waist. A pink satin cloth and matching shoes especially made by Jean Pierre are sure to make everyone fall in love with Miss Amour. Poppy Parker is a fully articulated 12.5-inch doll with fully rooted hair and hand applied eyelashes. For adult collectors ages 15 and up only. This doll cannot stand alone; a doll stand is included. It’s Springtime in Paris and Poppy is in love… with a poodle named Phoebe. The dog belongs to Mrs. Chatelain and Poppy enjoys taking Phoebe on long walks on days that she is free from modeling assignments. Today, they are walking through the Jardin des Tuileries. It’s a lovely place where Poppy can gather her thoughts and take in all of the beauty of the flowers. Poppy Parker is a fully articulated 12.5-inch doll with fully rooted hair and hand applied eyelashes. For adult collectors ages 15 and up only. This doll cannot stand alone; a doll stand is included. On a quiet night late in the evening, a girl likes to collect her thoughts about all of the things she’s experienced and all of her hopes and dreams in her diary. They are kept private behind a lock and key. Only Poppy and her teddy bear Plato Parker know where she keeps it. At Lemieux, her favorite boutique, Poppy purchased a sumptuous baby blue peignoir set that she is wearing this evening. An adorable baby doll nightie with delicate ribbon and lace detailing, a dramatic layered full-length sheer robe, and matching blue satin mules with pompom accents make her a sweet confection, perfect as a Parisian dream. Poppy Parker is a fully articulated 12.5-inch doll with fully rooted hair and hand applied eyelashes. For adult collectors ages 15 and up only. This doll cannot stand alone; a doll stand is included. From recording a hit record, to modeling some of the most fabulous designer clothes, to attending the most anticipated artistic premieres of the season, Poppy Parker quickly became the “toast of Paris” and the French could not get enough of her innocent, “gamine” elegance and incredible charm. To celebrate the end of her Bonbon tour, one of the top champagne wineries of France, Veuf Christoph Pomarin even named a special vintage in her honor, the fantastic “EDITION SPECIALE MISS POPPY PARKER” with its cute pink and gold label. This is definitely a trip that will stay engraved in our favorite girl’s heart forever as she sips her first taste of champagne! Poppy Parker is a fully articulated 12.5-inch doll with fully rooted hair and hand applied eyelashes. For her last night in Paris, Poppy wears a stellar sparkling navy blue gown with a long tulle train on the back, matching shoes and delicate jewelry. Of course, this look would not be complete without the special miniature champagne set that she received as a present from the Pomarin winery, especially packaged in a miniature golden box just for her!